It's no secret that I am really struggling to read at the moment and have been for the last couple of years. That doesn't mean to say that am not reading at all, just that the days of sitting down to start a book and finishing it a few hours later and then starting the next one are long gone. And really, I don't have much to complain about because my 2017 was amazing. As in A-maz-ing. If, when I woke up on New Year's Day last year, you had of told me about everything that would happen I wouldn't have believed it. 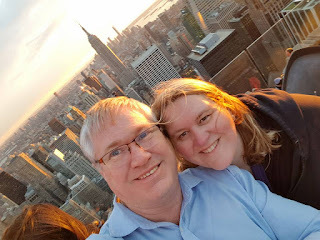 I met an amazing man, we've laughed and loved, cooked together, travelled (including to one of my bucket list destinations), my son has moved to America to play basketball, and more. Apart from work, which is .... average....but everything else! Fantastic. I did start any number of books, even from some of my favourite authors, that I just put down at some point and didn't pick back up again. I'm not sure that this year my reading will be any better but I hope so because I still love looking at books and talking about them and buying them and then not reading them. We'll see I guess. I am glad you had a great year! I missed reading in 2017, but, at the same time, I was doing other stuff in its place. So, it wasn't terrible. Hope 2018 treats you well! So happy for you Marg! All the best in 2018. Where did your son go to play basketball? My son is a big bball player too. He has had a player from Australia on his university team (in Canada) the last two years. Marg, you did read! So not a non-reader at all. Life sometimes gets in the way of reading more books, so hey, sometimes it works and sometimes it doesn’t. And what a fabbo year you *did* have! So have absolutely no regrets. Here’s to a brilliant 2018.